One of the most visited places in Istanbul is the famous historical market, Grand Bazaar!!! The end of the Byzantine Empire marked the beginning of a new empire – Ottoman Empire in the 15th century. You may wonder what this historical moment has to do with the Grand Bazaar, which is the focus of today’s discussion. It should be noted that if it weren’t for the Ottoman Empire, the largest market in the world i.e., the Grand Bazaar would not exist! Due to their adventageous geographical location, Ottoman’s were heavily invested in trading and it was their genius idea to have a wonderful bazaar, where merchants can trade all sorts of items. This led to the construction of the grandest of grand “the Grand Bazaar”. The breathtakingly stunning bazaar was built on Sultan Fatih’s order in 1461 to boost Istanbul’s economy. Located between Nuruosmaniye and Beyazit Mosque, the Grand Bazaar, is indeed, the largest historical bazaar in the whole wide world. Ever since it was constructed, the bazaar is a bustling place full of energy and noise, where travelers from all over the world visit to shop or sightsee. Truth be told, a day is not enough to spend at the Grand Bazaar. While initially, the bazaar featured only two warehouses – Inner Bedesten and Sandal Bedesten. Over time, with development, the Grand Bazaar also grew at a staggering speed. You will be surprised to find out that currently, there are about 61 streets and 4,000 shops operational at the Grand Bazaar! One of the most common rituals that visitors will come across at the bazaar is “bargaining”. Both sellers and buyers take a huge delight in this ritual. From antique, traditional decoration pieces to modern ones to intricate handmade turkish rug, turkish carpets and clothes, to beautiful jewelry, the bazaar features it all! The fascinating destination is a must-visit if you are planning a layover tour to Istanbul! 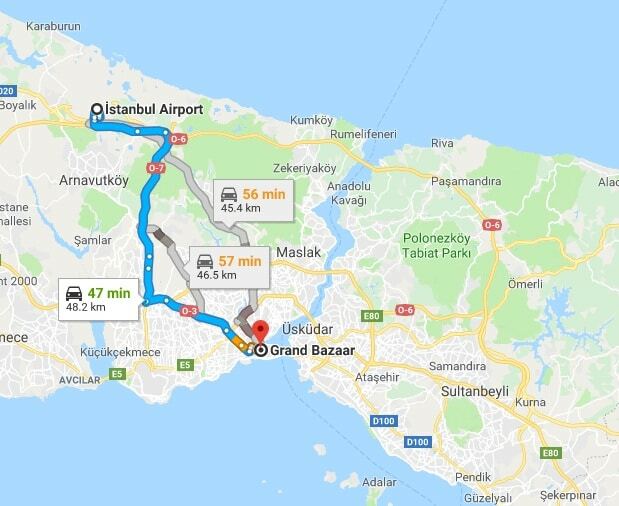 Visit Grand Bazaar in layover tour from New Istanbul Airport – Meet your guide at airport and enjoy your private transfer from NEW ISTANBUL AIRPORT. Explore hidden and rare craftsman shops in grand bazaar tour.